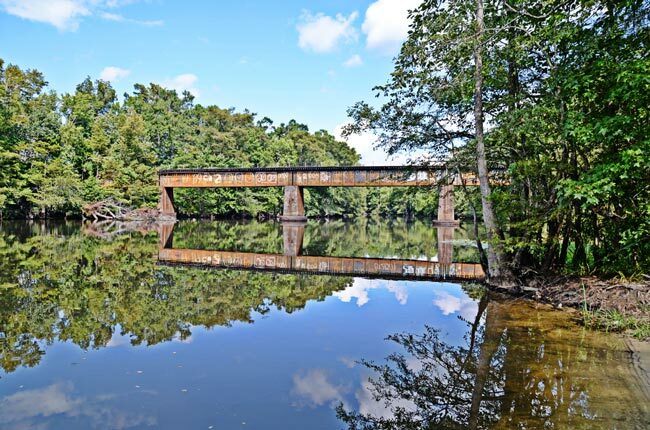 This 140-mile-long river – 111 miles of which hold the Scenic River designation – begins in North Carolina just above Lancaster County and flows to its confluence with the Great Pee Dee River in Johnsonville. Seven and a half miles of the river wind through the Lee State Park and Lynches River County Park (Florence County). The Lynches River is significant historically as well as environmentally. Venter’s Landing (previously called Witherspoon’s Ferry), where these photos was captured, is the site where General Francis Marion received his commission to command the Williamsburgh Militia during the Revolutionary War. The river itself is named in honor of Thomas Lynch, Jr., a signer of the Declaration of Independence. Lore claims that the Lynches River also served as a hideout for slaves during the Civil War. A portion of the river was mined for gold beginning around 1828, and mining continued until the federal government banned commercial mining in 1942. This ban was lifted in the 1980s, and mining resumed in the Lynches River and elsewhere. A 1990 mining accident at the Brewer Gold Mine in Jefferson spilled cyanide, used to leach and dissolve gold ore, into the Lynches River and killed 11,000 fish. This section of the river closed for a year until the spill was cleaned and the damage was repaired. 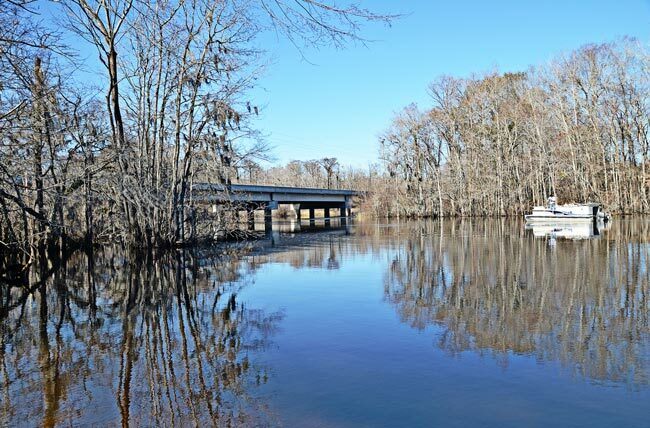 The Lynches River is home to a diversity of flora and fauna and ribbons through natural communities ranging from pine forests to farmland to swamps. At this Johnsonville access point to the river stands a bronze statue commemorating General Francis Marion’s command of his militia.